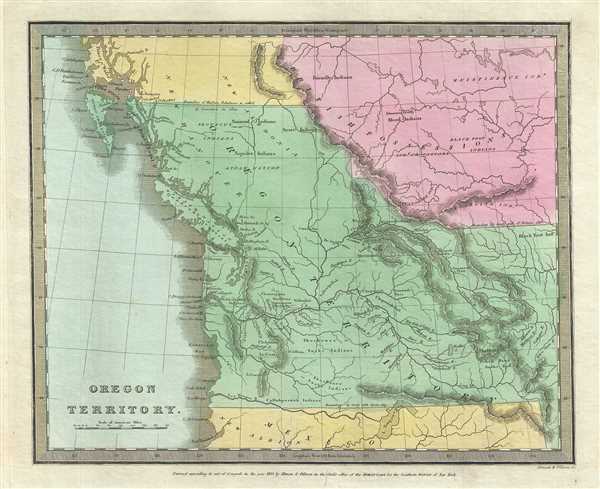 An interesting early American map of the Oregon Territory advocating American territorial claims to British Columbia. This is the 1833 first edition map of the Oregon Territory issued by David H. Burr. The map covers from the Los Mongos River and Lake Timpanoges (Great Salt Lake), north as far as Prince of Wales Island, including modern day Oregon, Washington, Idaho, and British Columbia. It advocates for American control over modern day British Columbia - then a hotly disputed region. Superbly detailed, it notes rivers, mountains, inlets and other topographical features, with relief shown by hachure. Several Indian tribes are noted. The boundaries of the Oregon Territories according to the treaty with Spain in 1819, the treaty with Great Britain in 1818 and the boundary of Russian possessions are noted and territories are color-coded. In 1818, United States and Britain agreed to joint occupancy of the Oregon County. Both the British, in the name of the Hudson Bay Company, and the Americans, championed by John Jacob Astor's Pacific Fur Company, were eager to claim monopolistic rights over the region. Astor's establishment of Fort Astoria on the Columbia River, identified here under its British name, Fort George, only served to further tensions with the Northwest Company - the Pacific subsidiary of the Hudson Bay Company. The dispute would escalate, giving rise to the Oregon Boundary Dispute and the American expansionist slogan 'Fifty-four Forty or Fight!.' The dispute was not resolved until the 1846 Oregon Treaty, which, through concessions on both sides, formally set the boundary at the 49th parallel. Rumsey 4628.048. Philips (Atlases) 771.